The St. Helens wrestling team knew what lay ahead. And the Lions knew it wouldn't be easy. So when St. Helens traveled to Rex Putnam High School for the 2018 Northwest Oregon Conference district tournament last week, the Lions did what they always do — they stepped up and fought. In the end, St. Helens placed sixth in the seven-team field, racking up 139 points in the event, held Friday and Saturday in Milwaukie. The complete team scoring included: Milwaukie 334.0, Wilsonville 302.5, Sandy 246.5, Hillsboro 200.5, Putnam 158.0, St. Helens 139.0 and Parkrose 10.0. While the Lions aimed to finish higher than sixth, the youthful St. Helens team proved itself competitive in many matches against some of the state's best Class 5A teams. "I was extremely proud of the kids," said St. Helens coach Greg Gadbois. "We are a very young and inexperienced team, and our effort really impressed not only our coaching staff but many other … coaches as well." In total, the Lions had 11 place winners in the tournament, eight of them freshman or sophomores. Of that group, qualifiers to the Class 5A state tournament included: senior Caleb Carter, second at 285 pounds; junior Joe Austin, fourth at 106; sophomore Ethan Hubbs, fourth at 126; senior William Webb, fourth at 138; and sophomore Ryan Burri, fourth at 152. The Class 5A state wrestling tournament opens with first-round matches beginning at 8:30 a.m. Friday at Veterans Memorial Coliseum, then continues with matches at 8:30 a.m. and 6:30 p.m. Saturday. Whatever lies ahead for those five wrestlers at state, Gadbois knows the hard work they've put in and the forward progress they made going in to the district tournament. "The training we have put in over the last few weeks has definitely been key to our result," he said. "District practices were more intense and the kids responded with more focus and effort than they had all year." That set up Carter's championship match against Iosefa Polamalu of Sandy on Saturday night. After a scoreless first round, Polamalu reversed Carter in the second period, then saw Carter notch an escape to make it 2-1 after two rounds. Carter tied the match with a third-period escape, but then was penalized a point and gave up a late takedown to drop a 5-2 decision. • Austin went 4-2 overall, losing by a second-round fall in his semifinal, then winning twice in a row later to secure fourth place, including pins over teammate Blake Gohlman and Parkrose's Trevor Nguyen. • Hubbs went 2-2 to open his tournament at 126, lost by second-round fall in his semifinal, then beat Sandy's Logan Bidema to wrap up fourth place and secure his berth to state. • Webb kicked off his tournament with two wins at 138, lost by technical fall in his semi, then rallied to win two of his next three contests, including a victory over Sandy's Luke Aufmuth in the fourth-place match. • Burri won twice to begin his tournament at 152, then split his next four contests, dropping a first-round pin in his semi, then beating Wilsonville's Andrew Gay to finish fourth. 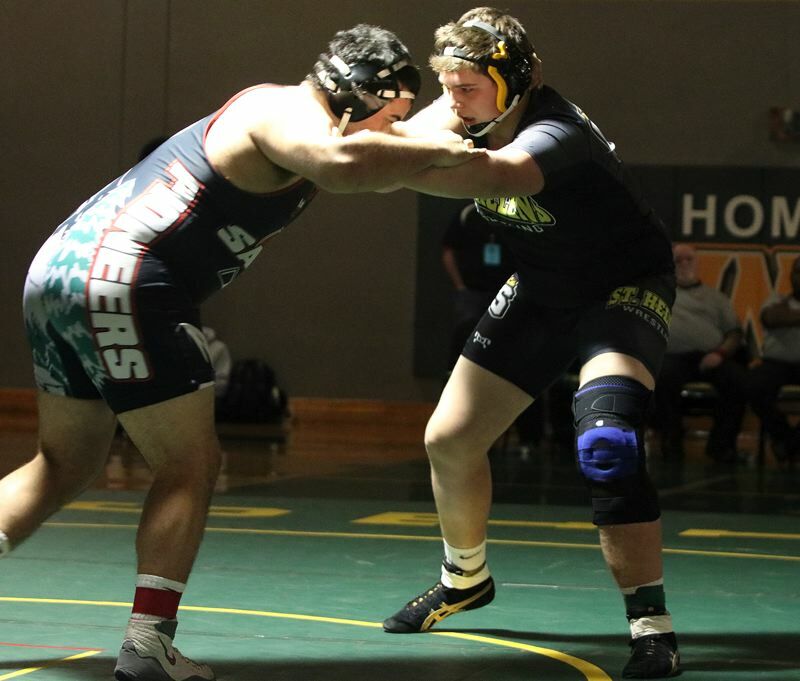 Additional St. Helens place winners included: Tristin Buchanan, fifth at 113; Maverick Rask, fifth at 160; Dylan Scott, fifth at 182; Gannon Carter, fifth at 195; Adam Stockwell, sixth at 132; and Benjamin Torres, sixth at 220.